Jimbo Fisher, head football coach of the No. 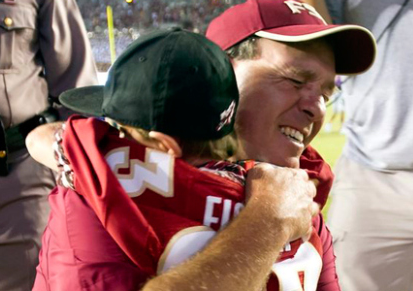 1 ranked Florida State University, is pictured here hugging his son, Ethan. Ethan Fisher has a rare blood disorder - Fanconi Anemia. It is transmitted autosomal recessively (thus requiring a single gene from each parent) and occurs in one of every 350,000 births (although higher in some demographics). These unfortunate people lack the ability for some DNA repair and as a result most develop cancer and bone marrow failure. From a body language point of view, this image is a great illustrator of affection display during a hug. Hugs are sadly all too rare - the average one lasting only about three seconds with sincere hugs lasting longer. One of several indicators of both affection and sincerity is eye closure during a hug. Ninety percent of a human being's sensory input is visual - and forty percent of the mass of the brain is dedicated to the visual system. Thus when the eyes are closed during a hug, there is a momentary small yet significant shunting of a portion of blood flow away from the visual centers and a down-regulation of electrical-chemical activity there. This allows the other four senses as well as the cognitive and emotional centers of the brain to up-regulate and become more sensitive. When we automatically close our eyes during a hug, it is because of our subconscious desire to experience every last drop of emotion. Our emotional brain wants to maximize the experience. Good luck Ethan Fisher - a long life of joy and health to you. Nonverbal Communication Analysis # 2108: Rihanna's and Chris Brown's Kiss and Hug What are they REALLY feeling?